RumeliDE Journal of Language and Literature Research began publication in 2014 in the field of language, literature, folklore, culture, translation, language and literature education; Academic, scientific and research-based articles. 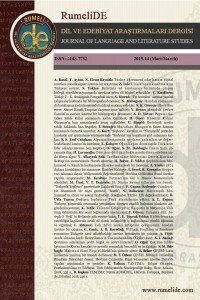 It is an internationally vigorous, open-access journal. The publishing language is in Turkish; But articles in English, French, German, Russian, Arabic and Farsi are also accepted. It is scanned in the Social Sciences index. It is published twice a year (October-April) in electronic format (www.rumelide.com) and in print. In addition, special numbers can also be published at intervals. Bilgin Güngör, Postkolonyalizm ve Edebiyat: Türk Edebiyatında Sömürgeciliğe Bakış, Hece, Ankara, 2018, 359 s.
Niyazi ADIGÜZEL, Hallerin Terbiyesi, Büyüyen Ay, İstanbul 2018, 246 s.